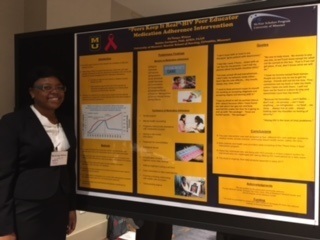 Da’Vonya Wilson, a seventh semester student in the traditional BSN program, represent the Sinclair School of Nursing during the poster session at the Association of Nurses in Aids Care Conference in Atlanta, Georgia. Wilson is also a McNair Scholar, and her poster, “Peers Keep It Real,” represents her research work with Dr. Maithe Enriquez. This research focuses on using peer educators to improve medication adherence in individuals with HIV.